In this strategy series, CoinPoker’s Chief Community Manager and pro poker player Isabelle “NoMercy” Mercier walks you through the basics of the game. 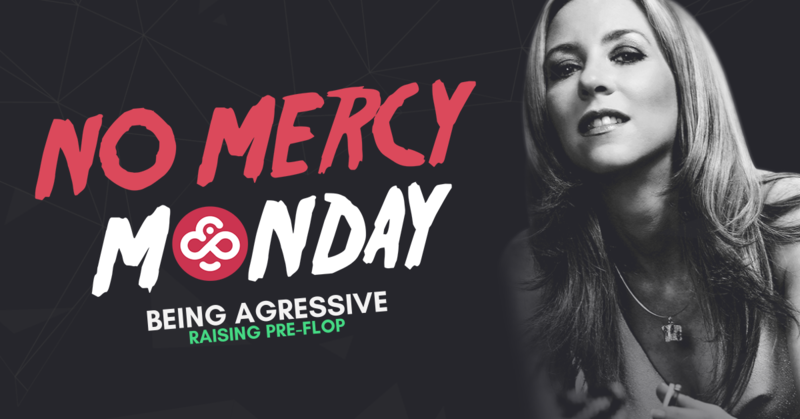 Each No Mercy Monday comes with expert advice on how to play, and it all starts with starting hands. A couple of weeks ago we introduced a new poker strategy topic: adopting an aggressive poker style. We will continue to explore the importance of being aggressive in poker by covering the many advantages and nuances of raising pre-flop. Over the last two weeks we saw why being aggressive is a winning style of play in poker, and how it will open the door to use the continuation bet as a powerful weapon. But there are other reasons why being aggressive is so much better than being passive. In a pre-flop scenario, for example, one of the main advantages of aggressiveness is that you could make everybody fold and win the pot without seeing a flop with one or multiple opponents. And you can’t do this by simply limping or calling a raise. Varying your play may scare your opponents as it will seem that you are using a very precise number to bet or raise according to your hand or strategy. This is nonnegligible, and even though the classic raise is 3 times the big blind, you do not have to stick with this amount every single time you raise! Varying your play may scare your opponents as it will seem that you are using a very precise number to bet or raise according to your hand or strategy. If you have the luxury of raising often, you could do 2.5 times the big blind, or even some min-raises. You could also raise 4 times the big blind from time to time, which could show even more strength, especially if you are in early position. However, very rarely will it be correct to raise 10 times the big blind! If you have a premium hand, you won’t get called often and therefore you won’t get value out of your hand. And if you have a weak hand, you will always be behind when someone calls this kind of disproportionate raise. So remember, a correct raise pre-flop usually ranges between a minimum raise and 4 times the big blind. After the flop and on subsequent streets, you should always evaluate the value of your bets or your raises in proportion to the size of the pot. Stay tuned for more tips next Monday. In the meantime, you can join me twice a week in the Hubble Bubble tournaments to practice your skills and try to win my 10,000 CHP bounty!